Alcohol is very much a part of Wisconsin’s culture. As a result, our clients don’t always welcome the recommendation to not drink when an issue of alcohol affects placement. I don’t mean recommending limiting drinking – I mean zero tolerance. Recently, in an unpublished opinion, citeable for its persuasive value, the court of appeals affirmed an order that a party not consume alcohol during her periods of placement. In Simon v. Wilson, No. 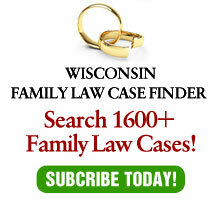 2015AP1769 (filed June 6, 2016), the appellate court found that Milwaukee County Judge William Sosnay appropriately exercised his discretion in considering whether a party has or had a significant problem with drug or alcohol abuse. The trial court found that the mother’s chronic illness called for use of medication that can cause mood disorders and that alcohol can alter moods. Therefore, the appellate court found that it was eminently reasonable for the trial court to prohibit her consumption of alcohol during periods of placement. While this gives trial courts the authority to make such orders, as lawyers for parties – on either side of this issue – we have an obligation to advise our clients on how to protect their children. This advice, wherever alcohol is an issue, is to go cold turkey. Zero tolerance. Alcohol is not necessary for human life. It is completely voluntary. Other than making a person feel better (sometimes), it serves no positive purpose. But it has many negative ramifications. For one, it can add to depression (and what person going through a divorce does not have some degree of depression?). Worse, it can lead to domestic violence. It can make driving dangerous. The list is long. So the arithmetic is simple: Nothing positive versus lots of negative. Unlike a lot of other problems, this one is easily solved. 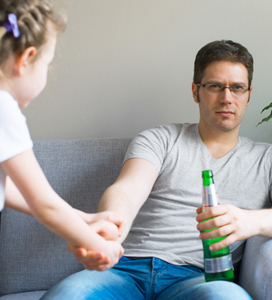 If a parent, knowing that alcohol use (note that I did not say “abuse” simply “use”) is an issue affecting the child and refuses to take the issue off the table, one of two things is true. Either that parent cannot stop drinking voluntarily, in which case the parent has an addiction problem, or the parent refuses to stop drinking, in which case the parent has a character problem. I suspect the latter problem is more difficult to treat. Many parties will resist the “zero-tolerance” solution, especially if the alcohol problem is mostly (or solely) that of the other parent. But this resistance should lead us back to the cost-benefit analysis. There is no cost (if anything, in fact, a savings in cost) and substantial potential benefits. You don’t even need a calculator to figure out which approach is favored. There are few problems in this area of law that can be solved without any corresponding cost. Drinking may, in fact, be the only one. There is no excuse, therefore, not to solve it. Editor’s Note: This article originally appeared in Inside Track, a bi-weekly newsletter of the State Bar of Wisconsin.